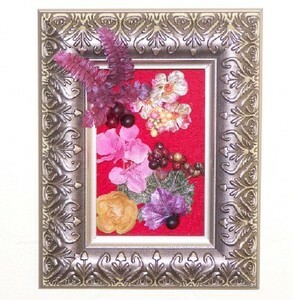 This shadow box is silver with red velvet in the inset. Inside are pink, purple, and gold flowers with a purple fern and berries completing the look. This box does not have a glass front. It can be hung or placed on a table like a picture frame. The size is 7-1/4" wide by 9-1/4" high.